In an instant experience era, data plays a new role. Businesses need real-time insights to drive decisions and deliver engaging customer experiences. Modern applications must handle unpredictable data and perform complex analysis without any delay, requiring you to fundamentally rethink your data strategy and architectural choices. Traditional disk-based processing cannot handle unpredictable data, or provide rapid responses from live data. Polyglot environments provide developers with many best-of-breed choices, but these piecemeal, fragmented approaches increase development and operational complexity, which in turn increases total cost of ownership. Redis Enterprise delivers a unique multi-model solution that helps businesses use heterogeneous data in real-time to build a new breed of data-driven applications. 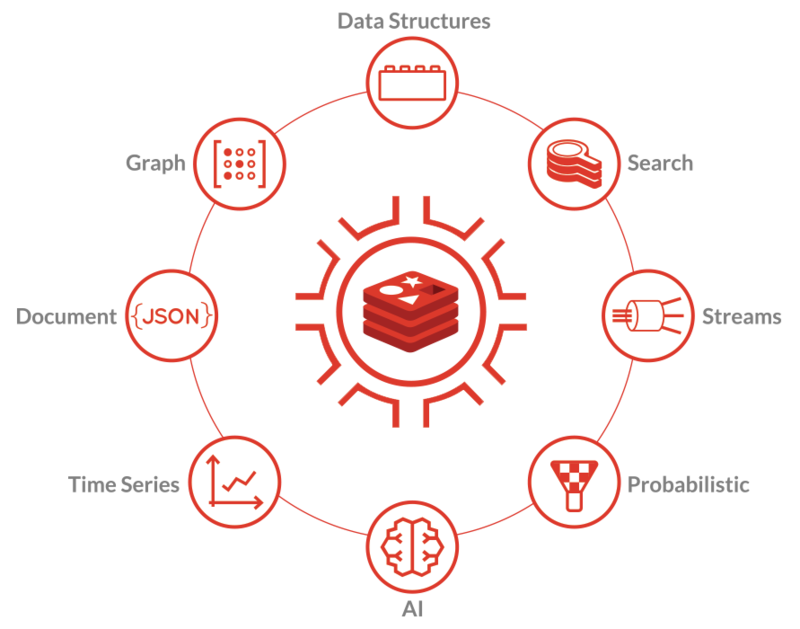 Empowering your application developers with great flexibility and sub-millisecond response times, Redis Enterprise brings the best data models together into a unified database platform. It supports key-value, document, graph and time series data, along with probabilistic data structures, comprehensive search, stream processing, and serving deep-learning and AI models. With exceptional performance across different data set sizes, Redis Enterprise connects structured and unstructured data to provide a solid foundation for any modern application. Combine and integrate distinct models, while enabling different lenses into the data, in real time, regardless of its structure. Allow data in one model to be used by another for inter-model communication. Maintain a single, serverless copy of the data by sharing a data structure across data models for faster, simpler computations. Reduce development complexity by automatically transforming, processing and querying data regardless of its data topology. A comprehensive and specialized data structure engine, Redis supports many state-of-the-art data structures with unique characteristics and commands to meet the real-time needs of your modern application. It’s not just a plain key-value store, and it’s not architected around tables or data relationship rules. With blazing fast performance and dead simple APIs, the Redis data structures and built-in commands help you transform hundreds of lines of code into simple method calls. No more duct tape, patches or operational headaches — Redis makes real-time continuous data processing simple. Redis Streams is a simple solution that stores and manages streams of events and lends itself nicely to distributed architectures so your services can easily share states with one another. It makes data ingest, stream processing and stream consumption faster and easier than any other stream database. It’s also easy to configure, easy to use, inexpensive to operate and scales to handle billions of messages at Redis speed. Redis’ native graph processing is designed for supreme performance and efficient storage to optimally store, manage and query graphs. Ideal for fraud detection, social networks, real-time recommendations, customer 360 and other similar use cases, you can now process connected data 10-600X faster and with 60% less storage. Do you love your document database but want more? When you have millions of data points coming at your application, a disk-based database raises the risk of lost data or excessively long processing queues. Redis can organize your document data as a native data type. It’s tailored for fast, efficient, in-memory manipulation of JSON documents arriving at high velocity and volume. As a result, you can store your document data in a hierarchical, tree-like format to scale and query it efficiently, which significantly improves performance over existing document-based database solutions. Modern applications often need to store and analyze billions of time-stamped events from log files, IoT device measurements, daily stock prices, hourly temperatures and more at scale. Our purpose-built solution efficiently collects, analyzes and stores time series data and automates downsampling, retention and compression of data, so you can manage data at the lowest possible cost. Extract your data into useful formats and visualizations to combine it with other data types for instant analytics. Probabilistic data structures, like Bloom and Cuckoo filters, are widely used to support data membership queries, thanks to their space-efficiency and constant-time membership functionality. That said, custom Bloom filter implementations aren’t easy to develop. Redis includes built-in support for both of these popular probabilistic data structures, as a speedy complement to its other data structures. Build state-of-the-art applications elegantly without requiring more computational power, cost or development effort with Redis. Ask any question of all your data and get real-time answers at blazing speeds with built-in rapid-fire search capabilities. Redis supports simultaneous indexing and advanced searches over fast-moving text, numeric and geospatial data. It is ideal for secondary indexing, fuzzy matching and suggestions, and auto-completes, Redis’ search outperforms leading search engines by a factor of 5-10X. Artificial Intelligence is a much-needed catalyst for extracting more value from data. But typical architectures require data to be migrated to and from siloed model execution environments, slowing down insights. However, it’s no longer necessary to distribute your tasks across multiple machines. Using Redis, overcome legacy architectural models and open a new set of deep analytical instant insights. By running your AI models where the data lives – in-memory – you can combine the speed of Redis with GPU-powered AI processing to make highly accurate decisions. Effortlessly integrate with industry-leading machine learning and deep learning models from TensorFlow, PyTorch and TorchScript to run advanced algorithms for real-time informed decisions.